Arlington, Texas is home to the International Bowling Museum & Hall of Fame, today’s “Museum of the Day”. I knew about this museum when it was still based in St. Louis, Missouri. We had a great group party at this museum during one of the American Alliance of Museum annual meetings in the gateway city. The International Bowling Museum and Hall of Fame collects, preserves and exhibits the 5,000-year history of the worldwide sport of bowling. From the ancient Egyptians to British monarchs to an enterprising German immigrant, follow the sport’s journey from archeological digs… to American taverns… to today’s cutting-edge computer assisted training centers. No visit to the International Bowling Campus is complete without experiencing the International Bowling Museum and Hall of Fame. I look forward to seeing this newer version of the museum I experienced in Missouri. 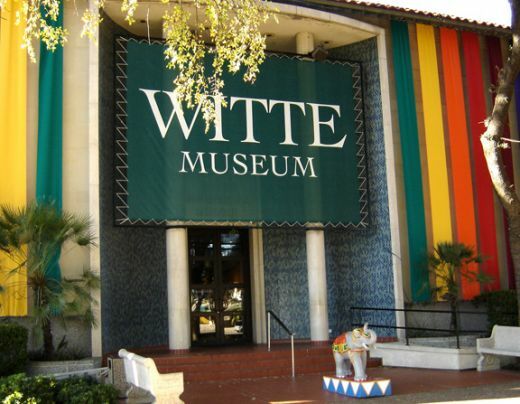 San Antonio, Texas is where you’ll find today’s “Museum of the Day,” the Witte Museum. The story of the Witte Museum is one of community vision and dedication that created an institution and has sustained it for 80 years. It is the story of men and women from diverse walks of life whose creativity was challenged as they raised funds literally one penny at a time to establish the museum that we still enjoy three quarters of a century later. The Witte Museum has proven as resilient as those who founded it. It has survived the Depression and wars, and in the 21st century remains the most heavily visited of San Antonio’s museums. San Antonio was a modern, thriving town in the early twentieth century, but lacked many of the cultural institutions that marked other great American cities. Notably, there was no public museum. Local residents relied on privately owned exhibits of art and zoological collections to provide them a glimpse of the wonders of the artistic and natural world. Unlike other cities, San Antonio in the early 1900s had no men and women of extravagant wealth to build their cultural institutions. Instead, the Witte Museum was the product of a disparate group of individuals that included the owner of a large natural history collection, H.P. Attwater, prominent clubwomen including Lena McAllister and Ethel Tunstall Drought, and Mayor John Tobin. They were inspired by a local high school teacher, Ellen Schulz, who envisioned a public museum for the enjoyment of all San Antonians. Ellen Schulz was aware that H.P. Attwater’s renowned collection was for sale, and after seeing it in 1922 she became determined to acquire it for San Antonio. By early 1923, schoolchildren were standing on street corners calling, “Spare a dime?” and community leaders had formed an organization they called the San Antonio Museum Association to assist in the effort. Through sales of bluebonnets, cakes and performances of “Peter Pan” and “Los Pastores,” the community contributed $6,200 to purchase the Attwater Collection, install it at Main Avenue High School, and open the city’s first public museum on October 8, 1923. Even before the museum opened, Lena McAllister suggested to Schulz that a formal museum be organized and constructed. The idea took hold as the Attwater Collection’s popularity inspired other donors and the museum soon outgrew its home. By 1924, Schulz, accompanied by her friend and high school principal, Emma Gutzeit, visited Mayor Tobin to enlist the city’s support to build a museum. Though the mayor reportedly first inquired, “What is a museum?” he was eventually converted to the cause. He was even convinced by Ethel Tunstall Drought, president of the San Antonio Art League, that the museum needed a second story where her organization’s growing art collection could be displayed. Led by Tobin, the city committed land in San Pedro Park, and on June 22, 1925, approved $25,000 for construction of the building. Ground was broken for the new museum on September 22, 1925, and then, two days later, local businessman Alfred G. Witte died. Museum advocates and the mayor were not aware that Alfred Witte, in his will dated June 6, 1921, bequeathed $65,000 to the City of San Antonio for construction of a museum of art, science and natural history to be located in Brackenridge Park and named for his parents. Within three weeks of Witte’s death, work was halted on the San Pedro Park museum and Mayor Tobin and Park Commissioner Ray Lambert selected a new location at the “third entrance” to Brackenridge Park (today Tuleta Drive) on River Avenue (today Broadway). Architect Robert Ayres shifted building materials to the site, enlarged the museum design to include two wings made possible by Witte’s generosity, and construction proceeded. Less than one year later, at a grand community celebration on October 8, 1926, the Witte Memorial Museum opened to the public. Anticipating the future, the San Antonio Express-News remarked, “The Witte Memorial Museum has a great field of service before it.” It was the realization of many dreams and the beginning of a long and interesting story. I know a few staff members at the Witte, and look forward to visiting with them when I’m in San Antonio again. It’s always a welcoming place to visit! Austin, Texas is the home of today’s “Museum of the Day”. Since 2001, The Bullock Texas State History Museum has been engaging audiences, to interpret for themselves, the continually unfolding “Story of Texas.” One of the most popular attractions in Central Texas, the Museum has been visited by over 6 million people coming from every state in the United States and every continent on Earth. Guests can explore the “Story of Texas” through three floors of exhibits that showcase artifacts from around the state; immersive special-effects films on history and culture in the Texas Spirit Theater; and Austin’s premier IMAX Theatre. From the 35-foot-tall bronze star sculpture that greets visitors as they arrive, to the campfire scene in the terrazzo floor in entryway that features a campfire scene with enduring themes from Texas’s past, every corner of the Museum proclaims the “Story of Texas” in a bold and new way. The driving force behind the creation of the Bullock Museum was former Lieutenant Governor Bob Bullock. The Museum is a division of the State Preservation Board. 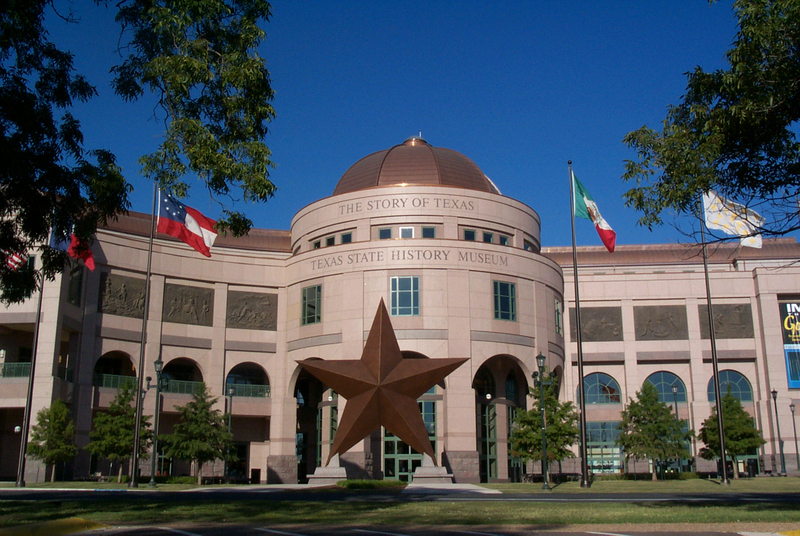 Today, I wanted to feature a museum about science located in the state of Texas. As we move around the country, I continually search for a diversity, not only in type of museum, but also in the size and scope of institution featured. The Houston Museum of Natural Science-one of the nation’s most heavily attended museums-is a centerpiece of the Houston Museum District. With four floors of permanent exhibit halls, and the Wortham Giant Screen Theatre, Cockrell Butterfly Center, Burke Baker Planetarium, George Observatory, and HMNS at Sugar Land and as host to world-class and ever-changing touring exhibitions, the Museum has something to delight every age group. 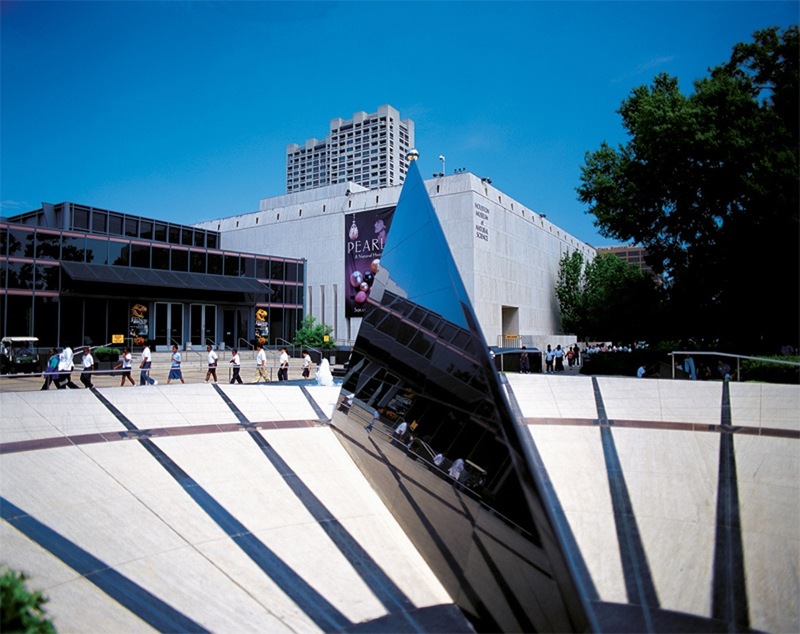 With such diverse and extraordinary offerings, a trip to the Houston Museum of Natural Science, located at 5555 Hermann Park Drive in the heart of the Museum District, is always an adventure. Visitors enjoy a world-class facility that includes the Wortham Giant Screen Theatre; the Burke Baker Planetarium; the Cockrell Butterfly Center; the George Observatory; HMNS at Sugar Land; and the Museum’s permanent exhibit halls. The Museum strives to continually offer new, entertaining and innovative educational films, exhibits and halls. Through the funding raised by a capital campaign, the Museum expanded its exhibit halls into the Dan L Duncan Family Wing and opened a newly designed Morian Hall of Paleontology in 2012 followed by the Hall of Ancient Egypt in 2013. The permanent exhibit halls, located on four floors, add additional science topics that range from the world-renowned Cullen Hall of Gems and Minerals, whose mineral collection is widely considered to be the best in the world; the John P. McGovern Hall of the Americas; the Texas-size Wiess Energy Hall, which is now a model for all others; the Welch Chemistry Hall with interactive, hands-on displays, exhibits, and a live demonstration theater; and more. In addition to creating its own exhibits like Lucy’s Legacy: The Hidden Treasures of Ethiopia ; Kremlin Gold: 1000 Years of Russian Gems and Jewels and The Human Genome: Reading the Book of Life , the Museum is host to a great variety of traveling exhibits from around the world that encourage visitors to return often. Some of these exhibits have included Body Worlds 3: The Anatomical Exhibition of Real Human Bodies ; Dead Sea Scrolls ; Terra Cotta Warriors: Guardians of China’s First Emperor ; Fabergé: Imperial Jeweler to the Tsars ; Titanic: The Artifact Exhibit and Saint Peter and the Vatican: The Legacy of the Popes . The Burke Baker Planetarium features immersive action technology called “Sky Vision” with high-resolution full color images completely controlled by computers. This projector system enhances images, giving them a “wrap-around” full-dome effect, putting audiences in the middle of the action. The Museum is one of two museums world-wide that produce and distribute large format films. Since 1994, the Museum has distributed five films, including Africa: The Serengeti (1994), the Academy Award™ nominated Alaska: Spirit of the Wild (1997), Amazing Journeys (1999), Kilimanjaro: To the Roof of Africa (2002) and Australia: Land Beyond Time (2002). The museum offers free WiFi. No audio tours and no mobile technology has been implemented. The museum has a very active and interesting blog, and it’s digital footprint can be found through most social media outlets. The museum website is not mobile-friendly (on the date of publication). There are different guided tours provided by the museum docents in some of the exhibit halls. Some are regularly scheduled tours, others require reservations and cost $5. To get more specific information, please visit this museum webpage. Prices and Membership information is available online. The museum is accredited by the AAM, so I am confident that their ADA accessibility is in compliance with the AAM guidelines. There is no statement available from the website. Fundraising Needs: Save Our Scope: The George Observatory’s Research Dome houses the world-class 10-ton Gueymard Telescope, the largest in the country dedicated to public education. It’s designed by the same folks that created the Hubble telescope. But unlike ANY other meter-class telescopes — you can actually look into the Gueymard! With other telescopes, your view comes through attached cameras or computer screens – with the Gueymard, you OWN the experience as you gaze into the wonder of deep space, and actually see a planet or galaxy with your own eyes. Want to help donate to the needed $80,000 technical updates? Visit this webpage. I enjoyed this video of the de-installation of “Dipsy” – it shows how museum work takes place in a fun and creative way.